UC Berkeley provides resources, information, and a variety of bike parking options for the campus community. With our partner and local bike organization Bike East Bay, we offer free Urban Cycling 101 classes on campus at Dwinelle Hall, lists of resources for new and seasoned cyclists, and opportunities to participate in fun events like Bike to Work month in May! We also strongly suggest everyone registers their bike with UCPD. Bicycle racks are provided at convenient locations throughout the central campus area. To reduce the risk of theft and vandalism, the campus is also equipped with three secure, covered parking facilities that are free of charge for University affiliates. Cyclists are advised to invest in a high quality lock for maximum security. 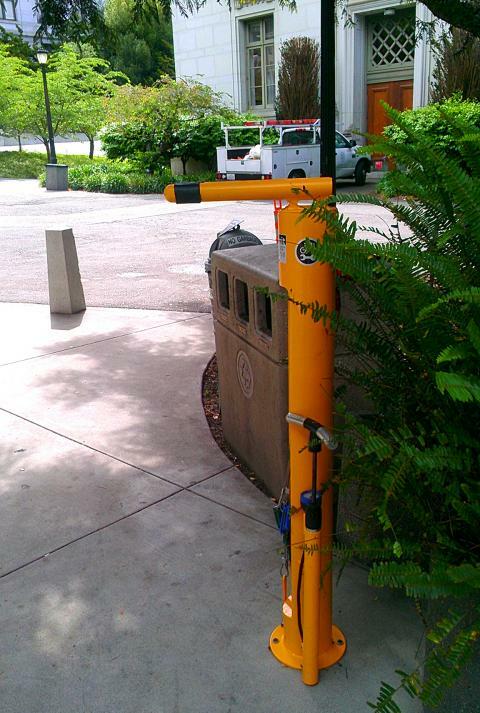 On campus, bikes must be locked to a University-designated bicycle rack and must not impede or block any campus thoroughfare or facility. UC Berkeley’s Parking & Transportation department has installed three secure and covered bicycle parking facilities on campus, for use by UC affiliates. This program is offered free of charge on a first come, first served basis. Access with a personal code. Parking enforcement patrols during business hours. Observation by parking attendants in facilities within parking lots on weekdays. Each facility contains bicycle racks. Bicycles must be locked to a rack using a high quality lock. Secure Bicycle parking facilities are locked and accessible only via a personal access code. The code allows the user access 24 hours a day, seven days a week. To apply, simply fill out the application located here. Upon approval of your application, you will receive your personal access code by email. Access codes are valid for one year and can be renewed yearly. Users must be campus affiliates (current faculty, staff, or student) with an active appointment or currently enrolled. Users are required to possess a valid California bicycle license for all bicycles that will be housed in the secure bicycle parking facilities. Licenses are available free of charge to campus affiliates. Secure bicycle parking facilities are meant to provide secure parking for bicycle commuters and not overnight storage. Bicycle storage is not allowed. Bicycles stored or left for long periods of time may be impounded. Sharing of access codes is not allowed. Use of access codes may be monitored to investigate misuse, theft, or property damage. The University does not assume responsibility for stolen or damaged bicycles. Bicycles parked in secure bicycle parking facilities must be locked to a bicycle rack using a high-quality lock. Bicycles must not be locked to the enclosure can cannot impede free entry or exit of cyclists or other bicycles. For students, staff, and faculty that would like to use one of two bikeshare programs in and around UC Berkeley. There are ten secure bike lockers on campus, eight at University Hall and two at Rec Sports Facility (RSF). The lockers at University Hall are located on the north side of the building, near the entrance to the Public Health Library. At RSF the lockers are on the Bancroft side of the building. Sign up for a Bike Link membership card. Membership is free but you need to put $20 on the card to activate it. Show up at a locker, insert your member card, and the door will open. The cost is $0.05 per hour; eight hours will cost $0.40). TIP: If you reserve the locker for five hours but only use two, you will be refunded for the time you did not use. TIP: These lockers can be found throughout the Bay Area!. Check it out. Bike lockers funded by Bay Area Quality Management. Need to air up a tire? Change a flat? True your wheel? There are two convenient repair stations located on campus at University Hall and in the Rec Sports parking garage bike cage. The University Hall station is located just inside the entry doors. The doors have an automatic opener allowing ease of access with your bike. The building is open approximately 6:45 am to 6:00 pm., Monday through Friday. The RSF garage station is open 24 hours a day but is only accessible to those with a secure bicycle parking access code. Campus Bike Map - preferred pathways, dismount zones & more. Always lock your bike to a bicycle rack. Use a high-quality “U” shaped lock. Avoid using lightweight cables or chains, or low quality U-locks. Always attach your bicycle to the rack through the frame and both wheels. Lock all easily detachable parts or take them with you. Avoid leaving your bicycle locked outside overnight. Check the lock before departing to ensure it is secured.